Anyone else just hear that mic drop? John Oliver didn’t hold back in his takedown of Donald Trump during the Sunday, February 28, episode of Last Week Tonight, attacking the GOP frontrunner on everything from his inconsistencies to his bullying ways to the origins of his real last name. The late-night host, 38, carefully laid out an entire slew of facts in his 20-minute segment that pointed to all the ways in which Trump, 69, has created a public persona that doesn’t quite match up with the man himself. “It may have seemed harmless a year ago, but now that it’s gotten frighteningly bigger, it is no longer wise to ignore it,” the comedian said, referring to Trump’s recent political victories. Oliver went on to explain that the very points that draw Trump’s supporters to him are the ones that make him a scary candidate in the first place. Oliver also brought up that one of Trump’s main campaign rallying points, that he is rich and therefore independent of influence, is a bunch of nonsense. The former Daily Show correspondent further pointed out that Trump’s name isn’t even real. According to his team’s research, in fact, the mogul’s real family name is Drumpf. 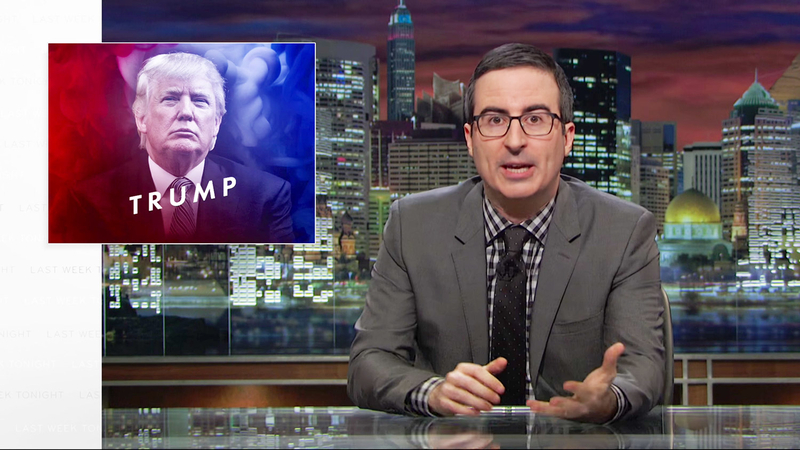 Oliver added that Trump’s flip-flopping ways may hurt America in the long run. "The scary thing is, we have no way of knowing which of his inconsistent views he will hold in office,” he said. “Private individuals are allowed to change their minds, we all do it. But when he&apos;s sworn in as President on January 20, 2017, on that day, his opinions are going to matter — and you will remember that date, because it&apos;s the one that time travelers from the future will come back to to try and stop the whole thing from happening." See what else the late-night host had to say in the hilarious clip above!